In April 1976, LRB returned to India after completing a very successful PhD from Columbia University. As planned, he was returning to IIM, Ahmedabad where he would join future luminaries like CK Prahalad, C. Rangarajan and others on the faculty. LRB had last been in India just over a year ago, between September 1974 and March 1975 doing surveys in the villages near Jodhpur, Rajasthan for his thesis. However, in the short period between March, 1975 and July, 1976 much had changed in India. 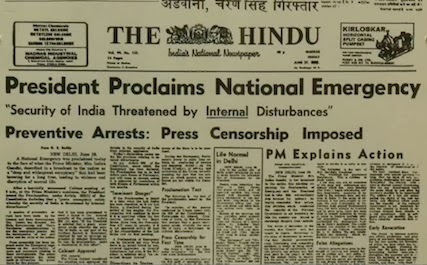 On June 25, 1975 Indira Gandhi's government had declared an Emergency, beginning a 20-month period during which civil liberties would remain suspended. The India that LRB and his wife Santosh returned to was no longer a free country. We have no hint of what LRB made of this event and of moving back to the India of 1976. Was he largely insulated and indifferent? Had he heard, from some of his colleagues from the corporate world, appreciative comments about the fact that the "trains ran on time." Dr. B. S. Bhandari, LRB's elder brother, who was also abroad at the time, says: "Emergency imposed by Indira Gandhi's government was a setback from political (democracy) point of view. Otherwise, in fact, the conditions improved considerably. Things moved fast and everything seemed to work reasonably efficiently and well. So this was not a problem as such." 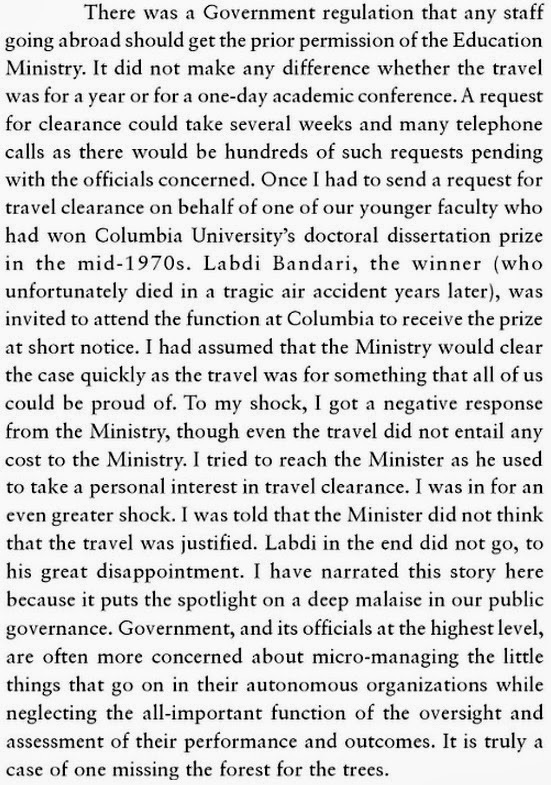 Or, was LRB, like his colleague and friend Prof. CK Prahalad, apprehensive about what was happening? LRB hardly had a choice about returning to India. He had signed a bond with IIMA in exchange for the institute sponsoring his studies and he was, in any case, committed to coming back to India. Regardless of how he may have felt, however, the Emergency was soon to directly impact LRB's life in very concrete terms. The story begins with some good news. 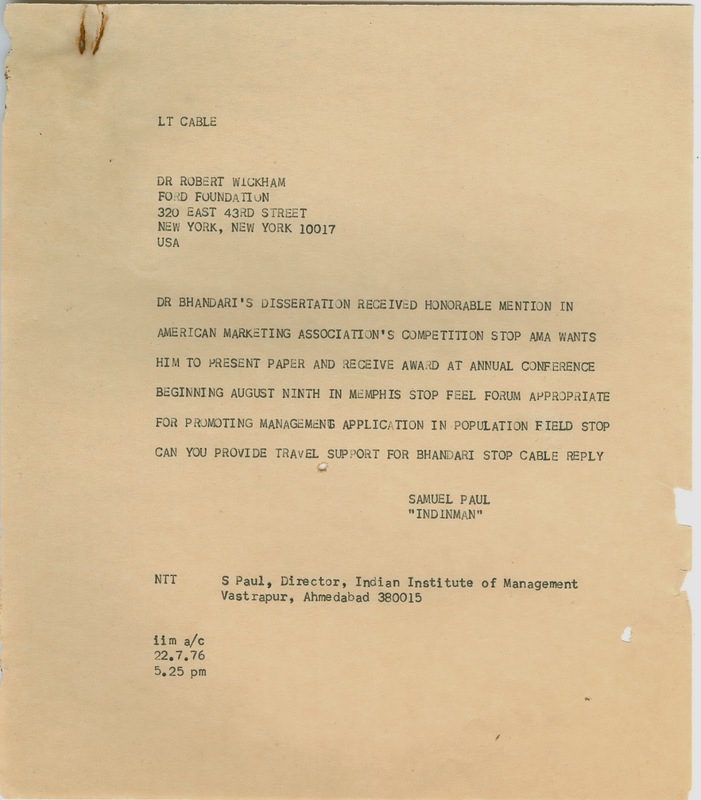 Some time in late July, 1976, LRB received information that his PhD dissertation had been selected by the American Marketing Association (the selection committee included Phil Kotler and other well known marketing academics) in a national competition for the John Howard/AMA award (the award would be named only much later). The AMA had it's annual conference scheduled for August 9, 1976 in Memphis, USA and the AMA wanted LRB to be there to present his work and receive the award. As LRB hastened to make plans, however, he would have realized that this was easier said than done in the India of 1976. An IIMA professor was an employee of the government (IIMA is an autonomous institution of the Government of India) and the rules then stated that an employee could not travel outside India without explicit permission of the Ministry of Education of the Government of India. He spoke to then IIMA director, Prof. Samuel Paul and wrote him a quick note on the 22nd of July saying that he was starting the process of obtaining clearance. He learnt, however, that till the question of funding was sorted out, he couldn't apply for permission. The first problem, therefore, was obtaining funding for the trip. LRB and Prof. Paul swung into action and a flurry of activity ensued that day. As LRB's doctoral work was on the use of a marketing approach to family planning communications, they sent a cable, on the same day, to Dr. Ned Roberto who ran the International Council on the Management of Population Programmes (ICOMP), which funded family planning research across the world. ICOMP declined saying it couldn't support travel, but offered to ask the Ford Foundation in New York which funded ICOMP (The Ford Foundation had also funded LRB's PhD through its funding to IIMA). 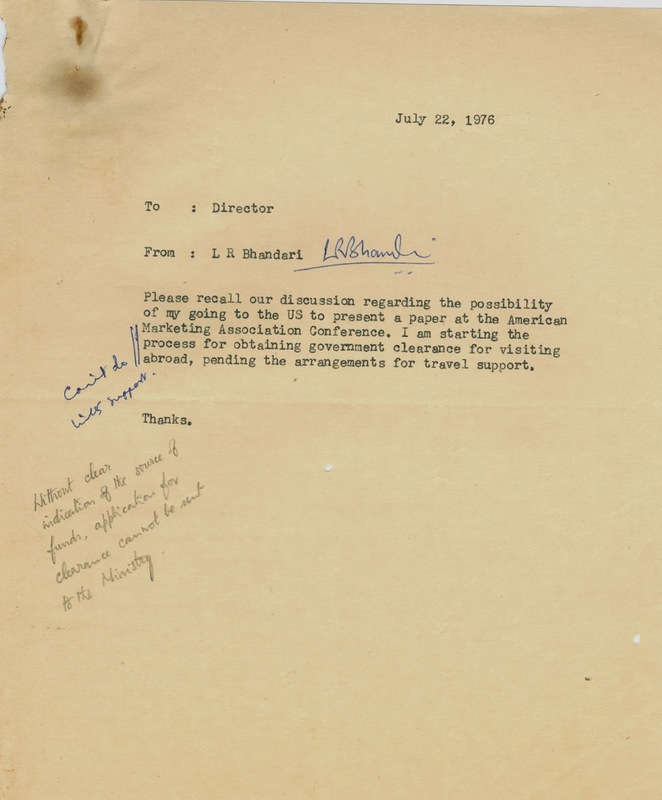 After a week long wait, they heard back from Robert Wickham that the Ford Foundation had agreed to fund the trip (see the correspondence below). It was already the 29th of July, and with the conference scheduled for the 9th of August, time was short. 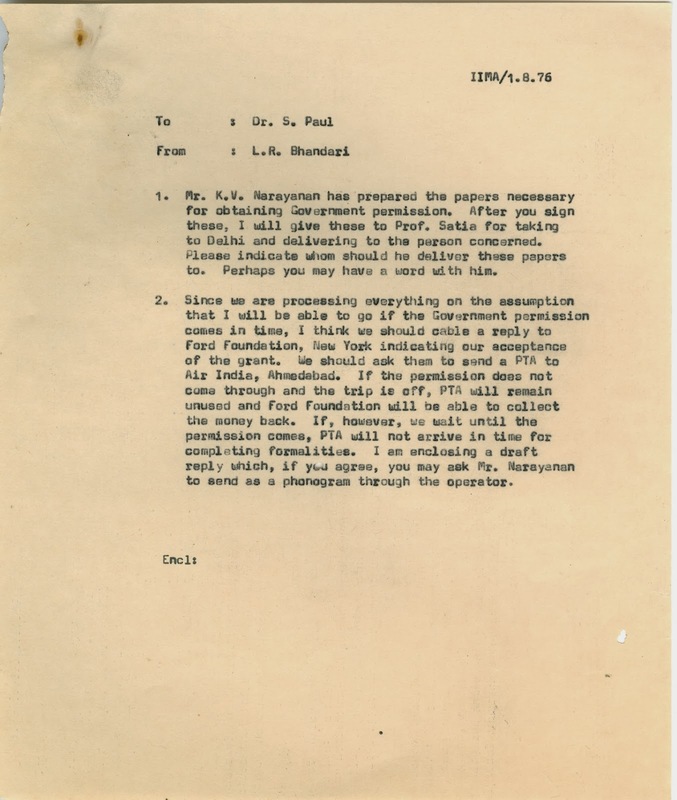 Prof. Paul immediately sent in a request for permission to the Ministry of Education while LRB made preparations, anticipating a positive response. A note he sent to the Director on the 1st August records his urgency. In the end, though, the Ministry, then headed by Prof. Nurul Hasan, refused to grant permission. 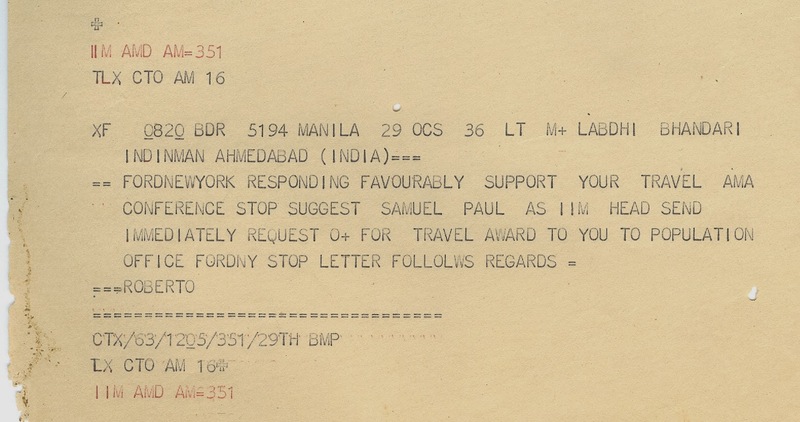 In hindsight, its possible to see how political calculations probably came into play with Indira Gandhi facing the heat in the west after for the Emergency. However, at the time, the response was both unexpected and disappointing and the incident stayed in both Prof. Paul's and IIMA's institutional memory. In his memoirs, Prof. Paul has narrated the incident..
Praful Anubhai, who spent many years on the Board of Governors of IIM Ahmedabad mentions this incident in his book, written 35 years later, when discussing the relationship between the faculty and the institute. LRB, understandably, was very disappointed at this outcome. His elder brother, Dr. B.S. Bhandari remembers that he was furious and considered resigning from IIMA at the time, but was persuaded by the institute to not take such an extreme step. However, the incident rankled and may have led to other repercussions. This incident and the general atmosphere of suspicion generated by the suspension of civil liberties during the emergency may have contributed to IIM-A losing another outstanding faculty member in 1977 when Prof. CK Prahalad decided to leave the country to continue his academic career in the United States. After Prof. Prahalad's death, his son Murali told the New York Times, “As a patriotic person, my father believed that (the Emergency) is not what India represented. They made a very tough choice to return to the United States.” LRB, who was one of the very few people who Prof. Prahlad had confided in about his decision, has been quoted by his friend, Madan Mohanka, to have said at the time: "If you don't let people grow, they will go." In the larger scheme of things, however, this was a minor incident - it only resulted in LRB not being able to attend a conference and receive an award. But, the Emergency may have had a much deeper impact on his career. When he returned to India, LRB was likely very enthusiastic about continuing his widely appreciated research on the social marketing of family planning programmes. A few months ago, in a meeting with Profs. David and Fran Korten at Harvard, he had discussed his hopes of getting the attention of top-level policy makers in India and persuading them to make their programmes more marketing strategy-oriented and situate family planning communication within the value system of the people being targeted, an approach that he had pioneered during his PhD. The notion of a marketing strategy, however, implies treating the citizen as a customer and advocates taking into account their wants, desires and value systems when communicating with them. During the Emergency, the population policy took a wholly different and nefarious turn. In April 1976, the same month that LRB arrived in India, the government approved a new population policy calling for new measures to 'encourage' family planning. It spoke of incentives, targets and the possibility of compulsory 'sterilisation'. Sanjay Gandhi, the prime minister's son, who had become an extra-constitutional authority during this period, was especially enthusiastic and made a big push to raise the number of sterilizations, if necessary by coercion. With civil liberties suspended, in just the 6 months between July and December 1976, the government recorded 6.25 million sterilizations (vasectomies and tubectomies), up from 2.7 million in previous 12 months. The widespread resentment towards the forced sterilizations is widely believed to have been a key factor in the wholesale rejection of Indira Gandhi and the Congress party in north India in the elections of the 1977. In effect, the excesses of the Emergency destroyed India's family planning programmes. As Esther Duflo and Abhijeet Banerjee have argued in their recent book, Poor Economics, "Tainted by the Emergency, family planning policies in India retreated into the shadows and in the shadows they have remained - some states, such as Rajasthan, do continue to promote sterilization on a voluntary basis, but no one except the health bureaucracy seems to have any interest in it. In the meantime, however, generalized suspicions of the motivations of the state seems to be one of the most durable legacies of the Emergency; for example one still hears of people in slums and villages refusing polio drops because they believe it is a way of secretly sterilize children." This legacy of suspicion may explain an abiding mystery - why did LRB not continue his award-winning family-planning work after his return to India? A reasonable hypothesis is that the environment for family-planning work in India became increasingly hostile after 1977. No government could afford to push family planning after the atrocities of the Emergency. LRB's expertise in the area remained unused as he turned to different subjects. *This note was prepared by Apoorva Bhandari on the basis of the LRB papers, published books, and the testimony of witnesses.